When the Obama "Mobile Comfort Team" arrived at 5:30 this morning outside the Olive Branch Baptist Church in Kansas City's Brookside neighborhood, they found a line wrapped around the building in advance of the 6 a.m. opening. The volunteers were met with cheers when they began handing out chocolate chip cookies. Determined to make the long lines more bearable for Missouri voters, the Obama team was also provisioned with coffee, magazines, camp chairs, children's books and trail mix. They said that a licensed massage therapist was planning to tour the urban precincts, giving free neck massages to voters grown weary and stiff while waiting. Texas: Who Did Early Voters Go for? Visits by Presidential candidates Obama and McCain have been as rare as jackalope sightings in Texas this campaign season, but apparently that has not dampened Texans' enthusiasm for the contest. Early voting turnout broke all the records this year with 8.5 million voters casting their ballots in the state's 15 most populous counties before early polls closed on Halloween eve. When the early vote totals come in from the state's other 239 counties the numbers could be staggering and Texas Secretary of State Hope Andrade is anticipating up to 68% of the state's eligible voters will have voted by the end of Election Day. Just what those high numbers mean in a state that is, for the most part, painted a deep red, is sending Texas pundits into hyperdrive. Is it Obamania? Evidence that Palin has inspired the base? Frustration at the economy (not as bad in Texas)? Or signs of a Democratic resurgence deep down the ballot over local issues like toll roads and education? Texans tend to describe themselves as conservative (48%) or moderate, according to a recent survey by the Texas Political Project, and have a rosier view of the Texas economy than the national one. Against that background, analyzing the turnout numbers is made even more tricky in a state with no party registration. Voters only "declare" their party when they vote in the primaries and this year most analysts believe up to 3% of the "declared" Democrats were crossover Republicans messing in the fight between Hillary Clinton and Obama. Montana has only three electoral votes and has gone GOP in almost every presidential race for the past four decades. (LBJ won it in 1964; but Bill Clinton took it in 1992 only because Ross Perot chomped into what would have been the Republican vote for George H. W. Bush.) 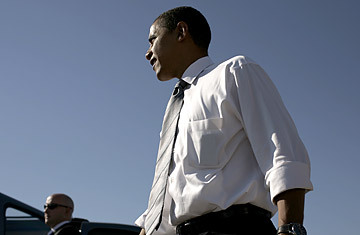 In 2008, however, the Obama campaign organized early for the Democratic primary there and has maintained its presence. Indeed, it has been running local TV spots continuously since June. While Barack Obama and his wife Michelle made several trips to the state this year, John McCain has not put in a single appearance. That kind of attention from the Democrats has apparently put the state up for grabs. McCain's first Montana TV ads appeared just two weeks ago. There appears to be some kind of rushed response to the tightening at the polls. The Montana state GOP challenged the registration of 6,000 voters in seven predominantly Democratic counties but drew a stern admonition from a federal judge. The Republican executive director lost his job shortly after. See pictures of John McCain's final push on the campaign trail.